Andrew Carman is a software engineer at Shift. At the core of any market is pricing. If you get pricing wrong, your marketplace doesn’t work. Our success at Shift—as a marketplace that makes it easy for anyone to buy and sell used cars—hinges on accurately and competitively pricing cars. Dealerships traditionally have a team of experts that price trade-ins for customers and manage the prices of their vehicles. They haggle over those prices with buyers that come to their dealerships, and often take advantage of consumers who have less access to car price data. Our goal is to make selling and buying a car a fun, fair, and accessible experience by using technology to disintermediate what car dealerships do poorly. So we build software instead of back-office sales teams to price our cars, which increases efficiency, levels the playing field for our customers, and lets us systematically improve the accuracy of our pricing over time. Read on to see exactly how we did it, and pass this along to the folks who might be interested in our approach. We all love our cars, but oftentimes we come across unavoidable problems and issues on the road that need a quick fix. Below, we collected a slew of handy car hacks to make driving a breeze and tide you over until your next maintenance appointment. Read on, and share these tried-and-tested tips from Shift with your friends! Kate Heddleston is an Engineering Manager at Shift. When I was first learning to play water polo, a coach told me something I’ve never forgotten. He said, “Great players make everyone around them look like great players.” A great player can catch any pass, anticipating imperfect throws and getting into position. When they make a return pass, they throw the ball so that the other person can make the catch easily. A 10x engineer isn’t someone who is 10x better than those around them, but someone who makes those around them 10x better. Over the years I’ve combined my personal experience with research about building and growing effective teams and turned that into a list of 10 ways to be a better teammate, regardless of position or experience level. While many things on this list are general pieces of advice for how to be a good teammate, there is an emphasis on how to be a good teammate to people from diverse backgrounds. Read on, and pass this along to the people you work and collaborate with on the daily! Here at Shift, we’re committed to empowering the women in our team through opportunities in leadership and professional development. As disruptors in an industry that is predominantly full of men, we are committed to building a team where everyone can feel welcomed, connected, and engaged as equal partners. In honor of International Women’s Day and the hashtag #PressForProgress, we asked some of the trailblazing women in our team to share their thoughts and insights about women in the workplace, and how their work impacts the lives of our customers and in shaping our company culture. Read on and get inspired! Mark your calendars for Sunday, March 11 — Daylight Saving Time (DST) is almost upon us! Ready to “spring” forward? This Sunday, you’ll need to advance your clocks with one hour. Later in the autumn, you’ll have to re-adjust the time back to the standard time, and “fall” back. It’s not that complicated, but when it comes to your kids, DST comes with its own set of issues. A new way to experience time can be a difficult adjustment for them. Here at Shift, we have a lot of customers with kids, and some of us even have kids of our own. So we’ve collected some handy tips that will ease the transition for your children, and make the time change as natural for them as possible. Read on—and if you have some tips of your own, share them with us in the comments! In this series on Shift, we round up all the must-see places and events happening every weekend in San Francisco. Scroll down, so you don’t miss out! With the 90th Academy Awards (a.k.a. the Oscars!) airing this Sunday, you might want to sit this weekend out and stay glued to your TV. But not so fast! We’re looking at an awesome agenda for you in the weekend ahead. To get you pumped up for the first weekend of March, read on for a few exciting events to entice you to get out, hop in your car, and have a blast. It’s time-consuming and it can sap the life out of you. With so many considerations — everything from checking under hood to deciding on a color — across a range of many options, shopping for a used car can overwhelm you and you may just end up settling on the first decent one you spot. Thanks to our Shift team of drivers and buyers across San Francisco, Los Angeles, and San Diego — the process just got a whole lot easier for you! Read on for our picks of the best used family, commuter, and luxury cars for the year ahead. Then, hop on to the comments and tell us what you think! Valentine’s Day may be over, but you can keep the romance going all weekend long with a last-minute getaway for you and your significant other. And if you happen to live in California, count yourself lucky! From national parks to wineries to beaches, you’re surrounded by a myriad of options for romantic escapes that are easily accessible by car. Recently, we expanded our coverage area to add even more places in Northern and Southern California. So we collected some of our favorite picks for the most swoon-worthy getaways to add to your long weekend agenda. Scroll down, and cue the wanderlust! When it comes to finding your perfect car, we at Shift love playing Cupid! During Valentine’s Day, we featured some of our very own happy customers who met their dream cars on our Facebook, Instagram, and Twitter. In case you missed it, we rounded them all up for you here in one post. Curious about what it’s like to buy or sell a car with us? Just read on and get the scoop straight from the folks who went through the easy-peasy experience! We run our Pizza Club the way we run our business – customer-centric, data-driven, and review-based. 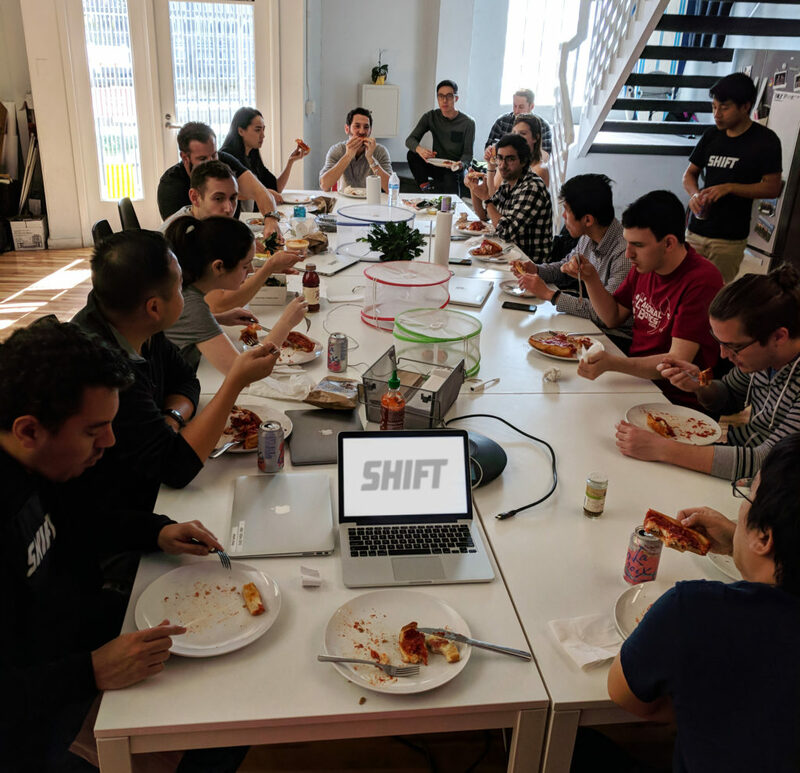 Fridays at Shift are known for Pizza Club. Once the smell of fresh pizza hits, Pizza Club members come together to enjoy slices from a chosen pizzeria around San Francisco. Lively debate centers around life and pizza – what people think about the pizza, whether calzones count as pizzas (unclear), or whether we’ll ever gain enough consensus to order a Hawaiian pizza again (unlikely). Today was our 34th meeting since our first gathering on 4/21/2017. In honor of National Pizza Day, we wanted to share our journey across 27 different pizzerias and counting. Get new blog posts in your inbox. No spam, ever. Shift Raises $140 Million Series D. Partners with Lithia.